The unit that would become the Hertfordshire regiment can be traced back to the 'Trained Bands' of the Tudor era, who were provided to the King in times of need but only served on home soil. This system was a variation of the feudal system going back into the Dark Ages, although no firm connection can be made back that far! Levies from the county bands were frequently called on for service in the European conflicts during the time of Queen Elizabeth I and the county band were amongst those who formed up to repel the Spanish Armada in 1588. There is also a connection to them providing the King's Guard even before the time of Queen Elizabeth I. During the English Civil War, the Trained Bands title was replaced with Militia and the 'Harts Militia' (as it was known) served on the Parliamentarian side, serving primarily under the Earl of Essex. During the Great Fire of London in 1666, they were called out to help fight the fire and throughout the early part of the Eighteenth century, they were called for service during threat of invasion in 1704 and the Jacobite rebellions in 1715 and 1745. The regiment was embodied for service numerous times during the troubled Eighteenth and Nineteenth centuries and the structure of the Militia changed almost as often, rounded off with the eventual formation of the Rifle Volunteers in 1860. During the Army's reorganisation of 1782, which saw all line regiments associated to a county to help with recruitment, the 49th regiment of foot adopted the county title, becoming the 49th (Princess Charlotte of Wales' Own Hertfordshire) regiment. In a further reform of 1881 (the Childers reforms) the regiment was linked to the 16th (Bedfordshire) regiment of foot and the new title become the Bedfordshire regiment. The two Rifle Volunteer Corps that formed the Hertfordshire regiment became the 4th battalion of the Bedfordshire regiment. Further changed in 1888 saw them re-titled as the 1st and 2nd (Hertfordshire) Volunteer battalions of the Bedfordshire regiment. During the South African Wars (the Boer Wars) of 1899 to 1902 the regiment served initially in Dublin but was one of the eight Militia units to be mobilised and served in South Africa between February 1900 and June 1902. 32 men were killed during their service and 1 C.B., 3 D.S.O. 's, 5 D.C.M. 's and 8 M.I.D.s were earned by men from the regiment. Haldene's reforms of 1907 saw the formation of the Territorial Force and the 1st and 2nd (Hertfordshire) Volunteer battalions of the Bedfordshire Regiment merge to become the Hertfordshire battalion. The battalion left the Bedfordshire regiment completely in 1909, being renamed as the 1st battalion, the Hertfordshire regiment (TF). Territorial Force soldiers met monthly at their local drill halls and once a year for Divisional level Army manoeuvres, which camps can be seen here, as they were in the same Brigade as the 5th battalion of the Bedfordshire regiment. The Hertfordshire Regiment was still a single battalion, Territorial Army unit when war was declared in August 1914 and fielded no Regular Army units whatsoever. Because of the association between the counties of Bedfordshire and Hertfordshire, many Hertfordshire men had served in the Regular Army ranks of the Bedfordshire Regiment throughout the Nineteenth century and this tradition continued throughout the Great War. Indeed, the Bedfordshire Regiment's badge proudly sported the Hart crossing a ford from the introduction of the county affiliations in the 1880's, in recognition of the connection. The annual Territorial Army summer camp of 1914 finished with emergency orders for all units to return to their bases and await further instructions. On the 5th August 1914 the entire Battalion was 'embodied' for war service with the East Midland Brigade, within the East Anglian Division. Once they had assembled at Romford in Essex, along with the other battalions of their brigade, the expected move orders to France did not materialise. Instead, they moved north, to Bury St. Edmunds and trained in the area for around two months. On 1st September 1914 the raising of a 2nd (Reserve) battalion was authorised and formed part of the 207th (2nd East Midland) Brigade in the 69th (2nd East Anglian) Division. Third and Fourth battalions were also raised in 1914 and served entirely on home soil. The 1st November 1914 saw surprise orders arrive that the 1st/1st battalion would mobilise and move to the Western Front. Early on the 5th November, they left Bury St. Edmunds and sailed via Southampton to Havre, moving onto St. Omer once fully disembarked. They arrived on the front lines 11th November 1914, losing their first casualties on the way through Ypres to take up positions near Hooge and being moved into the 4th (Guards) Brigade of the 2nd Division. Four years to the day later, they would be in the same region, having served entirely in France and Flanders. During the Great War, the Hertfordshire Regiment raised four battalions, who's service is summarised below. In August 1914 the 1st battalion were a part time, Territorial Army unit based in Hertford as a part of the East Midland Brigade of the East Anglian Division. The formation of a second line battalion in September saw the 1st battalion renamed as the 1st/1st battalion and in November 1914 they were mobilised for Foreign Service and sent to France to serve in the 4th (Guards) Brigade of the veteran 2nd Division. Because of this attachment, they were sometimes referred to as the "Hertfordshire Guards" and adopted many of the Guards peculiarities as a result, including naming their Companies by number rather than letter. The 1st/1st battalion of the Hertfordshire Regiment. The 1st battalion of the King's Liverpool Regiment. The 2nd battalion of the South Staffordshire Regiment. The 13th (Service) battalion of the Essex regiment - called the "West Ham" battalion who joined in December 1915. The 1st battalion of the Royal Berkshire Regiment - left in December 1915. The 1st battalion of the Kings Royal Riflre Corps - left in December 1915. The 1st/5th battalion of the King's Liverpool regiment - left in December 1915. The 1st/1st battalion of the Cambridgeshire regiment. The 1st/6th battalion of the Cheshire Regiment. The 4th/5th battalion of the Black Watch - amalgamated with the 1st/4th and 1st/5th battalions. The 11th (Service) battalion of the Royal Sussex regiment - called the "1st South Down's". The 12th (Service) battalion of the Royal Sussex regiment - called the "2nd South Down's". The 13th (Service) battalion of the Royal Sussex regiment - called the "3rd South Down's". The 1st battalion of the Essex Regiment. Almost 900 officers and men from the battalion fell in action between 1914 and 1918, with over 2,000 more being wounded or taken prisoner. Men from this battalion earned a reputation as a solid, reliable unit and, amongst the almost 200 gallantry medals won during the war were two Victoria Crosses. In 1914 they were lightly involved in The Battles of Ypres 1914 (also called The First Battle of Ypres). In 1915 the battalion were engaged during the Winter actions at Cuinchy in February, the Battle of Festubert in May and at the Battle of Loos in September. In 1916 the battalion were engaged in the Battles of the Somme 1916, including being lightly involved in the Battle of the Ancre Heights in October, as well as in the Battle of the Ancre in November. In 1917 the battalion were heavily engaged during the opening day of the Battles of Ypres 1917 (also called the Third Battle of Ypres and Passchendaele), when the battalion lost over 450 men during their assault on St. Julien, part of the Battle of Pilkem. They were also involved less heavily in the Battle of Langemarck in August, the Battle of the Menin Road and the Battle of Polygon Wood in September, as well as the Second Battle of Passchendaele in October. During 1918, the battalion was again heavily engaged. During the First Battles of the Somme 1918 (also called the German Spring Offensives, Operation Michael and Kaiserschlacht), they were heavily involved in the Battle of St Quentin, the actions on the Somme crossings and the Battle of Rosieres in March. In April they were also engaged in the Battle of the Lys, namely the First and Second Battles of Kemmel as well as the Battle of Scherpenberg, during which time their already exhausted Division fought as Composite Battalions. After being rebuilt, they were engaged in the Second Battles of the Somme 1918 (also referred to as the opening phase of "The 100 Days"), namely during the Battle of Albert in August and the Second Battle of Bapaume in September. In September they were involved in the Battles of the Hindenburg Line, specifically at the Battle of Havrincourt and the Battle of the Canal du Nord, as well as the Battle of Cambrai and the subsequent pursuit to the Selle in October. In the Final Advance in Picardy, they were engaged in their last series of actions, specifically in the Battle of the Selle in October and the Battle of the Sambre in November. Their final day in action came four years to the day from their arrival in France on 9th November 1914. The armistice two days later also marked the fourth anniversary of the first time they came under fire. The battalion was gradually wound down and finally disembodied in March 1919, although it was reformed as a Territorial Army unit again in February 1920, under the command of Sir H.P. Croft who had commanded them during 1915. Thomas Walter, Viscount Hampden, C.B., C.M.G., between 12th February 1913 and 26th January 1915, at which time he went onto become a Temporary Brigadier-General. Sir Henry Page Croft, C.M.G., T.D., M.P., between 28th February 1915 and 8th February 1916, when he was promoted to Temporary Brigadier-General. Frank Page, D.S.O., from 8th February 1916 to 31st July 1917, when he was killed in action leading the battalion during the assault against St. Julien 31st July 1917, aged 39. Eric Charles Malcolm Phillips, CB, DSO, TD, DL, JP, from 2nd August 1917 to 23rd March 1918, when he was taken prisoner during the battalion's stand against the overwhelming German Spring Offensives. Roger Wilkinson, D.S.O., between 13th April 1918 and 11th May 1918, when he was gassed during an attack on the Somme. Reginald Caunter Carthew, M.C., from 22nd May 1918 to 6th September 1918. John Lister Heselton, D.S.O., M.C., from 6th September 1918 to the disembodiment of the battalion in March 1919. Once it was understood that the 1st battalion would be sent overseas at some stage and that recruits would need to be found from home, the formation of a second battalion was authorised. It was formed from a nucleus of men from the 1st battalion in Hertford in September 1914, under Lieutenant Colonel Sir Charles E. Longmore, K.C.B. The battalion was initially named the Reserve battalion, with the purpose of finding recruits as replacements for the expected losses in the 1st line battalion, training them and providing home defence duties to counter the threat of invasion. At the end of October 1914, when the 1st/1st battalion were posted to the Western Front, around 200 of their number were not assigned for overseas duties, so moved into the Reserve battalion. By early November 1914 they already had their full complement and recruiting ceased. In December 1914 a further battalion was raised, causing the Reserve battalion to be renamed as the 2nd/1st battalion, at which time they were moved into the newly formed 207th Brigade of the 69th Division. Their purpose became one of predominantly providing home defence and they found themselves moved several times during their service. The 2nd/1st battalion was stationed at Newmarket from January 1915, Harrogate from June 1916, Darlington from October 1916 and Carburton between April and 20th September 1917, when they were disbanded. 2nd/5th Battalion, the Bedfordshire Regiment [Between January 1915 and 18th March 1918, when they were disbanded]. 2nd/1st Battalion, the Cambridgeshire Regiment [Between December 1914 and February 1915, when they transferred into the 54th Division]. 2nd/1st Battalion Hertfordshire Regiment [Between early 1915 and 14th March 1918, when they were disbanded]. 2nd/4th Battalion, the Northamptonshire Regiment [Between early 1915 and 14th March 1918, when they were disbanded]. 42nd Graduated Battalion [between summer 1917 and 27th October 1917, when they became the 51st Graduated battalion, the West Yorkshire Regiment]. 51st Graduated Battalion, the West Yorkshire Regiment [Between 27th October 1917 and 11th November 1918]. 52nd Graduated Battalion, the West Yorkshire Regiment [Between 23rd February 1918 and 11th November 1918]. 51st Graduated Battalion, the Leicestershire Regiment [Between 15th January 1918 and autumn 1918, when they transferred into the 208th Brigade]. 52nd Graduated Battalion, the Leicestershire Regiment [Between 17th January 1918 and autumn 1918, when they transferred into the 208th Brigade]. 52nd Graduated Battalion, the Sherwood Foresters [Between 23rd February 1918 and April 1918, when they transferred into the 208th Brigade]. 51st Graduated Battalion, the King's Own Yorkshire Light Infantry [Between May 1918 and 11th November 1918]. 52nd Graduated Battalion, the King's Own Yorkshire Light Infantry [Between May 1918 and 11th November 1918]. 241st Graduated Battalion [Between summer 1917 and 27th October 1917, when they became the 52nd Graduated Battalion, the Rifle Brigade]. As the structure of the rapidly expanding army developed during the autumn of 1914, it became evident that a battalion would be needed to provide the regiment's home defence element of the Division and another would be required to train new recruits in readiness for replacements for the front line unit serving abroad. To that end a third battalion was raised and formed in Hertford in December 1914. They grew in size rapidly and sent their first draft to the 2nd/1st battalion in February 1915, who had themselves sent a sizeable draft to the 1st/1st battalion on the Western Front late in January 1915. On the 8th of April 1916 they became the Regiment's "Reserve Battalion" and on the 1st of September 1916 became a part of the East Anglian Reserve Brigade. Around the same time their post was moved to Halton Park. The 11th July 1917 saw them merged with the 5th (Reserve) Battalion of the Bedfordshire Regiment, at which time the battalion ceased to exists in it's own right. The 3rd/1st battalion remained in UK throughout the war and found and trained drafts for the front line battalion as well as providing a degree of Home Defence duties if required. The 4th and final battalion of the regiment was formed in Thetford in November 1915, by a cadre from the 2nd/1st Battalion, as a part of the 206th Brigade of the 69th Division. The battalion remained in UK, serving at Harrogate from July 1916 and Welbeck between April and August 1917, at which time they were disbanded. 4/1st Battalion, the Hertfordshire Regiment [Between 17th November 1915 and August 1917]. 2/4th Battalion, the Essex Regiment [Between December 1914 and 6th December 1915]. 2/5th Battalion, the Essex Regiment [Between December 1914 and March 1918]. 2/6th Battalion, the Essex Regiment [Between December 1914 and January 1918]. 2/7th Battalion, the Essex Regiment [Between December 1914 and 10th October 1917]. 51st Graduated Battalion, the Rifle Brigade [Between 27th October 1917 and February 1918]. 51st Graduated Battalion, the Northumberland Fusiliers [From 27th October 1917 to 11 November 1918]. 52nd Graduated Battalion, the Northumberland Fusiliers [From 5th March 1918 to 11th November 1918]. 51st Graduated Battalion, the Durham Light Infantry [From 15th January 1918 to 11th November 1918]. 52nd Graduated Battalion, the Durham Light Infantry [From 15th January 1918 to 11th November 1918]. 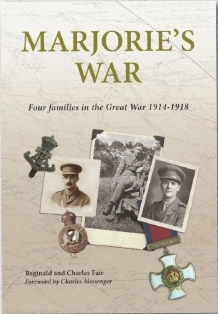 'Marjorie's War tells the story of Marjorie Secretan and her two wartime romances which were divided by tragedy. Through letters and diaries we obtain an intimate view of both relationships. Letters which were sent from home and survived the trenches are rare, and those presented here give a female and Home Front perspective on the war and its impact on Edwardian England. However, it is not just her story. Marjorie was the central character who connected the lives of four families. Drawing on an archive of unpublished letters and photographs, the book also gives insight into life and death in the British Army as seen through the eyes of nine young men from the four families. They all volunteered in 1914 and served as infantry and artillery officers. Unusually, the correspondence spans almost the entire duration of the First World War, since at least one of the letter-writers took part in each of the major battles on the Western Front from early 1915 onwards. The letter-extracts are supported by original research and extensive footnotes which describe their context, such as certain key actions affecting the letter-writers. The paperback version RRPs at £22.95, with the hardback at £32.95, and £1 from each book goes to the Western Front Association. It can be ordered directly from the author by emailing him, or through Amazon and other retails channels.